Basecamp Classic: How do I update my time zone? Each Basecamp company has a time zone setting. The people within those companies will inherit that time zone. Learn about company time zones. What happens when people live in different time zones? Basecamp can help! 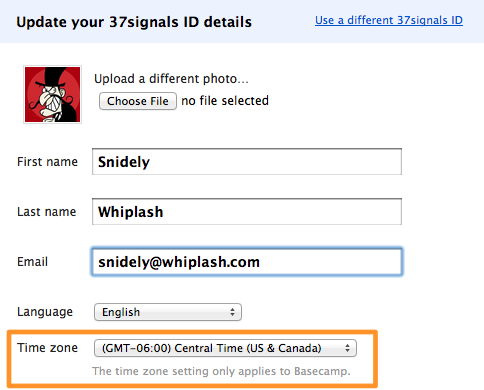 Each person in your Basecamp account will be able to set their own time zone. Go to your My Info page (link in the top right corner), and click the ‘Edit your personal information’ link. Note that Daily Digest subscribers will receive their daily email at 9am according to their company’s time zone. You can adjust your time zone settings in Backpack and Highrise as well.